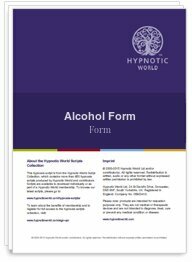 This Alcohol/Drug Dependency Diagnosis Form can be downloaded and printed for use in your hypnotherapy sessions to decide the best way of treating your client's addiction, and finding the causes of it. Why use a specific alcohol/drugs diagnostic form with clients? Alcoholism and drug addictions are often amongst the most complex issues to treat. Causes are often linked to childhood, experiences with parental alcoholism and narcotics abuse, and a range of other factors which can lead a person to substance abuse, and these need to be identified during sessions in order for treatment to be the most effective. A hypnotherapist often offers useful pointers in deciding on the best approach to tackling a client's problem, and this Alcohol/Drug Form enables you to gain the most useful insight into your client's background with a specific view to their substance abuse and the contributors to it. It aims to obtain information on a wide range of common sources of substance abuse, and can be used in determining patterns in an addiction. This form is fully printable - and an essential tool for any professional hypnotherapist.